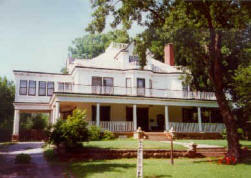 The Stone Lion Inn, located in Guthrie, Oklahoma was once an old mansion, but has now been converted into a lovely bed and breakfast. Formerly used as a funeral home, the mansion now offers luxurious accommodations, a cozy restaurant, murder mystery weekends, and even some ghosts! First reported signs of ghostly activity occurred in 1986, when the mansion was purchased by Becky Luker. With the help of her two sons, they converted the house into a lovely bed and breakfast. However, soon after moving in, the family began hearing someone walking up and down a stairway at night and the sound of a door opening and closing. They called the police several times, who found nothing. It was then that the family soon realized that their newly purchased inn came along with some ghosts. Apparently the most haunted areas of the house are the back staircase of the house, where the footsteps were heard between the hours of ten and midnight, and the large closet on the third floor, where Mrs. Luker's youngest son stored his toys. The toys and games would be neatly put away each night and the door locked, however, by the next morning, they would be found scattered all over the floor. The Stone Lion Inn has been featured in the following books. Ghosts of the Southwest by Ted Wood; Way Down Yonder In the Indian Nation by Michael Wallis; Mysterious Oklahoma by David A. Farris; Haunted Highway Rt. 66 by Ellen Robson & Dianne Halicki; Elmer McCurdy: The Misadventures in Life and Afterlife of an American Outlaw by Mark Svenvold (left). The Skirvin Hotel is operated by corporate-monster Hilton hotels, but The Skirvin still retains its original distinct beauty and elegance since it first opened its doors in 1911. 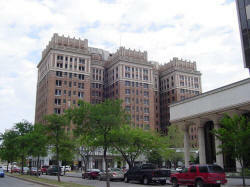 Not your run of the mill small, quaint haunted inn, The Skirvin is a huge hotel – has three wings containing 525 rooms. Despite its enormity and being operated by the Hiltons, The Skirvin Hotel has some secrets…..it’s the home to a ghost named Effie. The ghost story begins during the days of prohibition, when the creator of the hotel, oilman W.B. Skirvin had an affair with one of the hotel’s maids. To avoid any scandal, the maid was locked in a room on the top floor of the hotel, even after she gave birth. Obviously distressed, she grabbed her baby and she jumped out the window. No one ever knew the name of the maid. However, the ghost was nicknamed Effie by its employees. Though the old hotel closed in 1988, former guests would report being disturbed at night by the consistent crying of a baby. Other interesting or scandalous hauntings include Effie herself. Men who have stayed at the hotel claim being propositioned by a female voice. One man even claimed to have been sexually assaulted by an invisible entity! Whereas others have seen the figure of a naked woman with them in the shower. Fifteen years later, the newly refurbished Skirvin has reopened its doors. It will remain to be seen whether Effie stuck around to mingle with today’s guests.